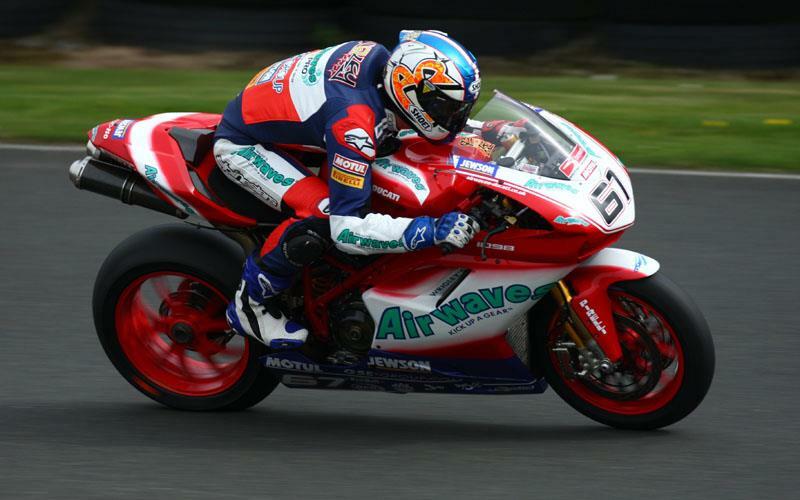 Airwaves Ducati’s Shane Byrne has taken the first British superbike win of the day at Oulton Park this afternoon after a brilliant battle with Leon Haslam in the final few laps. Leon Camier announced his full recovery from his horrendous Cadwell Park injuries in style to take the final podium place in third. Haslam’s HM Plant Honda team-mate Cal Crutchlow had looked like continuing his rich vein of form after his Thruxton win by storming into the lead, but a crash put paid to that. Rain started to fall right as the riders came back round from their warm-up lap but the race started. The race was red flagged and allowed those who had come off to get back to the pits to get on their spare motorcycles if they could. After around a 10 minute delay, the field took to the Cheshire circuit again. On the restart it was Leon Haslam who took the lead into the first corner, but Tom Sykes was once again back up the front within a couple of corners. Haslam and HM Plant Honda team-mate Cal Crutchlow were behind. Simon Andrews was first to retire from the race as he crashed out on lap one. Cructhlow had got the better of Haslam to take second by the end of lap one. On lap two Shane Byrne took Haslam by the lake and now Leon was sandwiched between the two Airwaves Ducati’s with Leon Camier behind him. Heading into lap three Crutchlow was setting himself up to take the lead. He did pass Sykes, but ran wide and the Rizla Suzuki rider got the advantage back. On lap four Crutchlow gained the lead back, while the bad luck continued for Karl Harris as he high-sided his Yamaha at Druids. Already riding with injuries from Thruxton, he had to be helped over the tyre wall to safety. By the end of lap six Crutchlow had gained a 1.68sec gap on Sykes, but the Rizla Suzuki rider had more important things on his mind with Shakey Byrne behind him, who then took his second place on lap eight. After seemingly settled in third, Tom Sykes now had a charging Leon Camier on the other Airwaves Ducati behind him and chasing him for his place by lap ten. Leader Cal Cructhlow came off at Lodge Corner, he did manage to rejoin but came back on to the circuit behind team-mate Leon Haslam in fifth. This handed the lead to the BSB veteran Byrne, and then Camier made it an Airwaves Ducati one-two as he passed Sykes on lap 11. And Sykes also lost his last podium place to Haslam by the end of that lap to go fourth. And then the battle of the Leons began on lap 13 as Haslam challenged Camier for second. Haslam did manage to get by, but Camier was not going to give up his place that easily. But Haslam did make his move stick on lap 14 to move into second. As the rain began to fall again, Haslam then set about going after leader Byrne who waqs more than 1.5secs ahead, but by lap 16 had just a 0.8sec lead. Going into the final lap Byrne was just 0.35secs ahead and Haslam was looking to set him up. He passed him going towards the lake, but ran wide and Byrne got his lead back and kept his advantage to take the first win of the day. With Haslam in second, it was down to Byrne’s team-mate to take the last rostrum palce, while early leader Cal Crutchlow finished in sixth. Winner Shane Byrne said after the race: "I was on the limit most of the time. It was a bit too dry for the wet tyres and the team took a bit of a gamble before we went out there. "Airwaves Ducati one and three so I'm happy."